Public can buy direct from the quarry and save $$$'s! Suppliers of sand, sandstone and sandstone products for domestic and commercial projects. Grants Rd Sand supply sand to Newcastle, Sydney and Central Coast. We are conveniently located only 8km from Freeway - 45 minutes to Sydney & 1 hour to Newcastle. We can arrange delivery for bulk sandstone and bulk sand loads to Sydney, Newcastle and Central Coast or pick up is also available where we have the convenience of an 'on-site weigh bridge'. Sandstone varies in colour from white, yellow, red/brown through to mauve ironstone. So whether you need Sand, Landscaping supplies, Sandstone, Quarry stone, Sandstone blocks, Sawn sandstone, and more, feel free to contact us for more information to see samples or for quotes and orders. Contact Steven on mobile 0418 116 861. 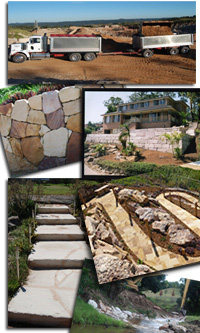 "I'd just like to say, THANKS for great service & products in the supply and delivery of the Ripped Retaining Wall Rock. How good was this, I rang in the morning (after viewing your website), Spoke with Steve and goods delivered the same day, just hours after placing the order." "I would have no hesitation in recommending Grants Rd Sand to any person or company interested. Their level of service is excellent and their knowledge of the producst is enormous. We had lots of questions and concerns and someone else recommended them to us. We're so glad they did! Top shelf "
"Hi guys, just wanted to say thank you for all your help and advice last week. What you recommended has worked perfectly and we're really pleased with the end result, it's perfect! I must say that the level of service you give is very high and it's good to see that old fashioned customer service is still alive and well on the Central Coast!